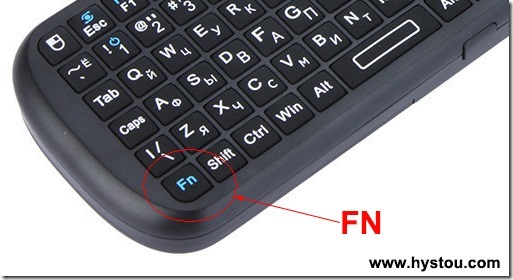 Fn, short for function, is a modifier key on many keyboards, especially on laptops, used in a compact layout to combine keys which are usually kept separate. It is typically found on laptops due to their keyboard size restrictions. It is also found on many full-sized “multimedia” keyboards as the F-Lock key. It is mainly for the purpose of changing display or audio settings quickly, such as brightness, contrast, or volume, and is held down in conjunction with the appropriate key to change the settings. Typically, in a compact layout the main area of the keyboard (containing the letter keys) is kept in much the same layout as with a full-sized keyboard, and the numeric keypad is moved to share a group of central keys. This allows typists to enter text without having to learn a new layout. The symbol that is accessed through pressing Fn is often printed on the key in a smaller font or different color (usually blue). The above 78-key UK layout is taken from the Apple iBook. Characters in blue are accessed through the Fn key, but functions on the top row can be accessed without Fn key in Mac OS X.
Fn is not a normal keyboard key, such as the modifiers Ctrl, Shift and AltGr. For a standard modifier key, the microcontroller inside the keyboard sends a scancode for the modifier itself, which is then interpreted by the operating system and combined with other simultaneous key-presses. 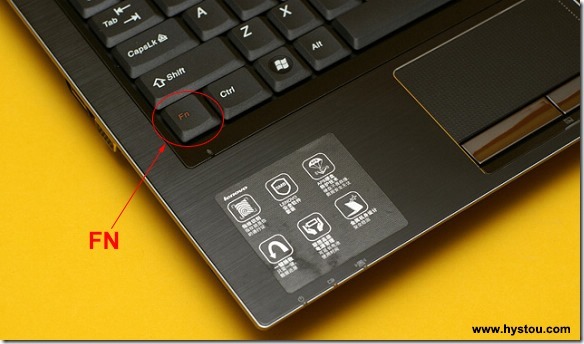 The Fn key is a form of meta-modifier key, in that it causes the operating system to see altered scancodes when other keys on the keyboard are pressed. This allows the keyboard to directly emulate a full-sized keyboard, so the operating system can use standard keymaps designed for a full-sized keyboard. However, because the operating system has no notion of the Fn key, the key can not normally be remapped in software, unlike all other standard keyboard keys. While it is most common for the Fn key processing to happen directly in the keyboard micro-controller, offering no knowledge to the main computer of whether the Fn key was pressed, some manufacturers, like Lenovo, performs this mapping in BIOS running on the main CPU, allowing remapping the Fn key by modifying the BIOS interrupt handler; and Apple, in which the Fn key is mappable and serves other uses too, as triggering the Dictation function by pressing the Fn key twice. In addition to being mapped to standard keyboard keys like Scroll Lock and Num Lock, the Fn key combinations may also be mapped to control system interfaces to change the LCD brightness, VGA output, or speaker volume on most laptop computers.